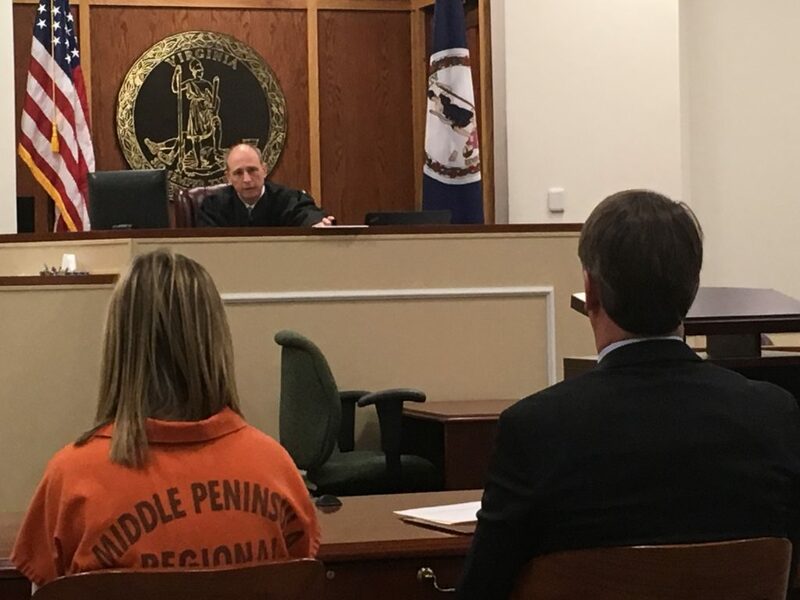 Just in time for senior prom, GibsonSingleton Virginia Injury Attorneys Ken Gibson and John Singleton staged a mock “driving under the influence” (DUI) sentencing trial for Middlesex High School students on April 20. The trial demonstrated what can happen when teens drink alcohol and drive. Attorneys Gibson and Singleton worked with Middlesex County School Resource Officer and event organizer Chris Gatling to organize this memorable event. Gibson played the role of prosecutor while Singleton played the role of defense attorney, pretending to oppose each other in the courtroom. Middlesex County Commonwealth’s Attorney Michael Hurd acted as judge. Middlesex High senior Haley Revere and GibsonSingleton Virginia Injury Attorney John Singleton stand as Middlesex Commonwealth’s Attorney Mike Hurd, playing the judge, pretends to sentence Revere for vehicular manslaughter and driving under the influence in a mock trial for teens on April 20. What happened in the mock trial? 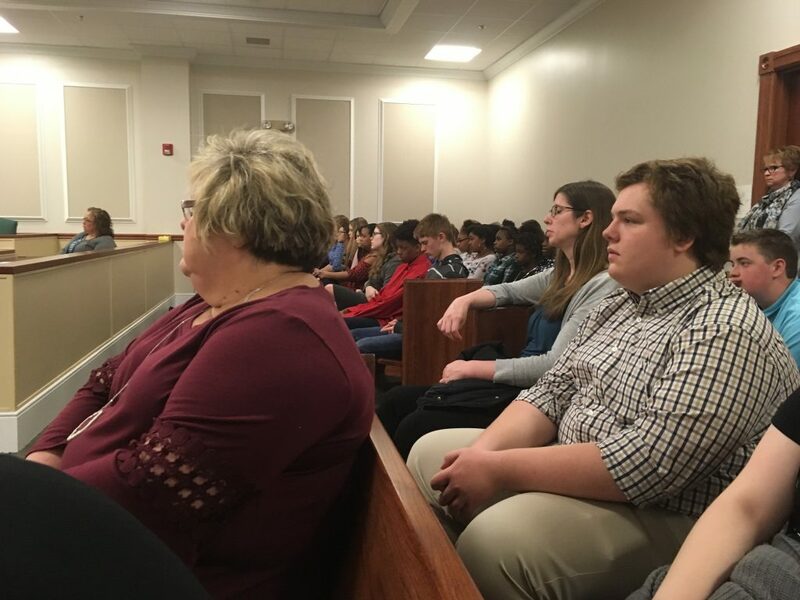 Middlesex High School senior class members, along with some Middlesex eighth graders, were ushered into a courtroom in the Middlesex Courthouse. The group was shown a moving video to set up the scenario of what can happen when students drink and drive. Next, Middlesex senior Haley Revere was introduced as the defendant, a girl who rarely drank alcohol, but who had gotten drunk, was involved in a wreck, and accidentally killed her best friend, Brad Shaver, as he sat in the passenger’s seat. The defendant’s real mother, Becky Revere, played the role of the convicted teen’s mother, and Middlesex Sheriff’s deputy Casey Mewborn summarized his “investigation” of the tragic accident for the courtroom. Middlesex Deputy Melinda Hart played the role of Mary Shaver, the grieving mother of Brad, the student killed in the mock event. Middlesex High School senior class members, along with some eighth graders and parents, listen carefully as a mock trial is presented, in which a student convicted of drunk driving in a wreck that killed her best friend is sentenced to prison. 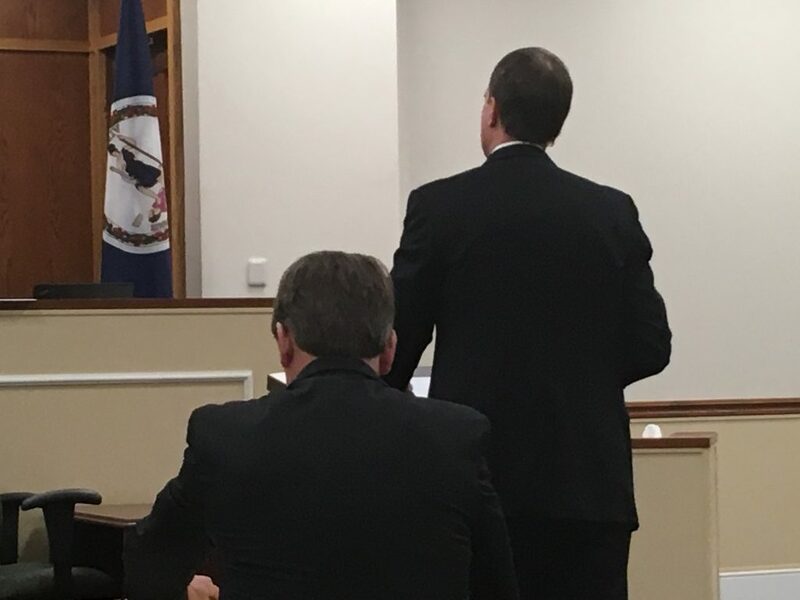 “Prosecutor” Gibson reminded the judge that the defendant was more than two times over the legal blood alcohol level to drive in Virginia. Gibson stated that this was not an “accident,” but rather the result of several poor choices made by the defendant. Gibson asked the judge to sentence her to 17 years in prison, one year for each year in the short life of the victim. “Defense attorney” Singleton agreed with Gibson that nothing could make up for the death of the victim. But Singleton asked the judge to offer the defendant “mercy, not just punishment,” because she had already served her community in so many ways, and because of the guilt she will always live with following the tragedy. 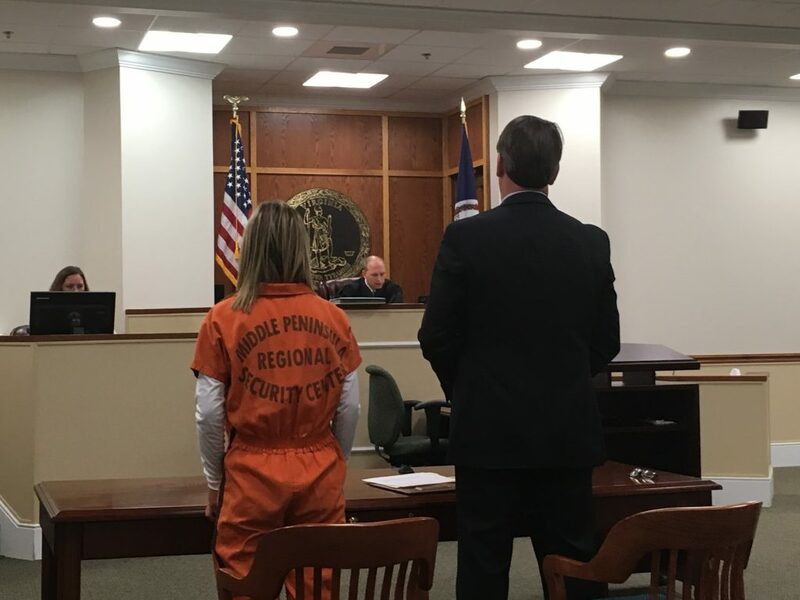 In the end, “Judge” Mike Hurd sentenced the defendant to four years in prison, with 17 years of her sentence suspended, conditioned on the defendant being placed on supervised probation after she is released from prison. Hurd told her, “You knew better, and you should have known how your decisions could affect others.” Hurd encouraged her to continue to help others, and he expressed the hope that she could one day attend college following her prison sentence. Law partners John Singleton and Ken Gibson pretend to oppose each other in a “driving under the influence” (DUI) sentencing trial for Middlesex High School students on April 20. Following the mock trial, Gibson and Singleton gave each student attending an agreement card for teens called, “Keys to Safe Driving.” Teens were encouraged to share it with their parents, and to make a contract with them to obey the rules of the road, stay focused on driving, and follow the laws about using drugs and alcohol. You can watch highlights from the mock trial here on the Southside Sentinel’s website. GibsonSingleon Virginia Injury Attorneys is also offering a $1,000 college scholarship to a high school or college student who writes the winning essay about how young people can drive more safely. The deadline to apply is May 30, and the winner will be announced on July 3. More information about the safe driving agreement for teens and the college scholarship is available at GibsonSingleton.com, or by contacting GibsonSingleton’s community outreach director, Beth Gibson, at [email protected] or (804) 413-6777. Middlesex High senior Haley Revere pretends to be a defendant in a mock DUI trial. GibsonSingleton VA Injury Attorney John Singleton pretends to defend her, while Middlesex Commonwealth’s Attorney Mike Hurd plays the judge, in an event staged to demonstrate the consequences of drunk driving to teens.